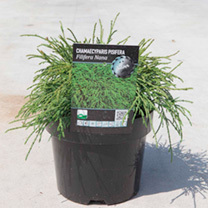 A compact dwarf conifer that is perfect for smaller gardens and even containers. Filifera Nana forms a mound of dark green foliage with a slight weeping appearance ideal for rockeries and borders. Height 301cm+. Supplied in a 3 litre pot.